Do you need a bigger container than 5 gallon or 6.5 gallon pails? Perhaps you can take a look at this 8 gallon square EZStor bucket. With more storage capacity, 8 gallon square pails are perfect for businesses or big households that have the space and the items to store in their warehouse or garage. These 8 gallon square EZStor buckets come in 6 packs per purchase. They are not exactly designed to be a mobile container since the handle is recessed. Besides, depending on what you are storing inside, 8 gallon container is rather heavy to carry around. These big babies are able to contain food materials with approval from FDA for being food grade container. And if you buy these pails, they automatically come with plastic lids that include tamper evident tear tab strips. The lids also have hinge that enable you to do quick dispensing and refilling. 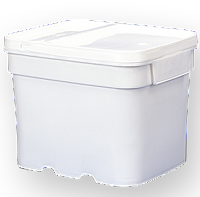 With the dimension of 13 ¼" wide, 16 ¼" long and 12 ¾" tall, own some of the 8 gallon square pails to store your bulk items until their next use.